SYNOPSIS: In a desperate attempt to escape destruction decades earlier, humankind was forced underground, into the depths of the earth, creating a new society called the Tri-Realms. REVIEW: To be honest, I've only read 2 (YA) dystopia books and the one that I liked was The Hunger Games. Generally I like the dystopian concept but I find that I have trouble really getting into the story because there's so much to take in. Dystopian settings are so much to digest let alone the story itself. 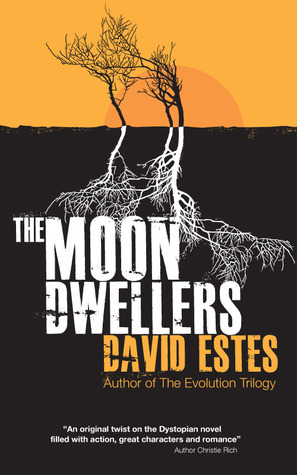 I decided to give The Moon Dwellers a shot because of two things: 1) "forced underground" and 2) David Estes is super nice! Okay reason number 2 sounds like I'm sucking up but whatever. Primarily what I liked about The Moon Dwellers are the vivid descriptions. Action packed scenes (which were a lot) were really told in detail - not just generic terms to indicate pain say inflicted by a punch to the gut and whatnot. Aside from that, since this is set in a world so different, it was nice that David Estes was able to paint a picture of how the underground Tri-Realms look, from the structures, the characters, down to their outfits. Although at one point, wherein Tristan used the word "tunic" to describe how "hot" Adele looks, I can't help but laugh. It was a bit funny (funny weird and funny ha ha at the same time) but it wasn't entirely odd. Just... funny. Another thing I liked in particular was the pacing. I wasn't hurried into getting a feel of the conflict but at the same time it wasn't so slow that I had to skip a lot of pages just to get through it. I just hate it when some books (not just dystopian) just feed me the conflict without really helping me get into it. You know? The story slowed at key parts where you really need to take the time to read delicate back stories about certain characters without having to dwell too much on it. It was just right. I also liked that the story was told from two alternating perspectives: Adele's and Tristan's. I liked that some chapters were connected to the one before or after it. Even if Adele and Tristan were in two different places, it's like their stories either go within one story line or they meet at one point. I think this helped keep the momentum going, which also contributed to how smoothly the story went. I didn't really pay much attention to the love angle, or the insta love angle. Looking at it now though it's great that the love angle was inserted subtly, at least that's how I saw it. The attraction between Adele and Tristan was rooted from the weird painful physical connection that they had. My take on it is, the were curious at first but their feelings grew along the way. It was nothing wild or loud or I profess my undying love for you! It was just... there. Like I said, it was subtle to me. Perhaps my only issue is how late the historical background came. It's typical among dystopia novels to have the back story about how the new world came to be in the beginning of the book. But in The Moon Dwellers, it was told a few chapters in, in one of Tristan's chapters to be specific. While I appreciate that it was written in Tristan's POV (because the back story involved his bloodline), I still think it came a bit late. Before that chapter all I was thinking of was, why are they underground? Isn't it hot the nearer to you get to the Earth's core? Yeah... I tend to over think things. Lastly, and this is the reason why I'm giving this review a 5 out of 5 despite my little issues, I think the character development is superb! I've always said that the only way for me to give a book a 5-star rating is if it gives me a hangover. Considering the fact that this book is first in a trilogy, it's bound to leave you hanging. But a hangover is different - it's the pull that makes you want to continue reading or to read it again. That same pull that leaves you wishing the characters in the book were real and that you're friends with them. I've read books with sequels that weren't very engaging so even if it did have a cliffhanger, I didn't bother reading the next books. The Moon Dwellers had a lineup of characters that would really leave you attached to the story so much so that they'll make you laugh with them, cry with them, celebrate with them. I highly recommend that you read The Moon Dwellers. If you liked The Hunger Games, then I bet you'll like this too. Well formed plot, remarkable set of characters, overall great writing - what more can you ask for? I know it resembled a bit of The Hunger Games in terms of the power struggle, i.e. the poorer realms give the rich realm supplies, the rich realm lives lavishly while the poorer ones suffer etc etc. Even if this is present, I didn't factor it in in this review because in dystopian books there's has to be a class/power struggle. I'm only saying this as a "side note" because I want to give the future readers a heads up... before you go saying stuff like "this is just like The Hunger Games yada yada yada." Keep in mind that what makes THG different is well... THE HUNGER GAMES. The Moon Dwellers' plot is different but equally exciting. Great review! I love this series and the second book is even better! I agree with you that the vivid descriptions really make this book awesome. I also really like the world building and how much thought there is behind it. Great review, Isabel. This book has been on my TBR list for a while and I hope to read it soon. :) I love the multiple POV thing, just like it was in Marie's Lu's Legend, another Dystopian book I want to read. I wanna read Legend! I just haven't found a copy yet. Sad.